Pillow Fighting in Trafalgar Square London? Yes! Being in the UK on a consultancy spree, we heard about something fun and exciting and free happening in the nation’s capital. 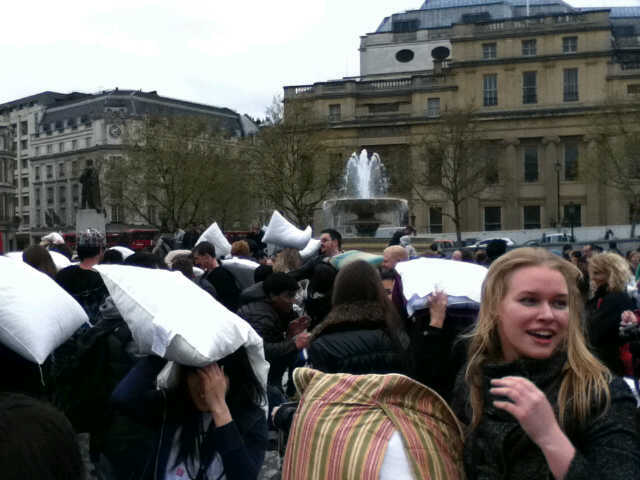 So obviously we headed down to Trafalgar Square in London to take part in the 2012 International Pillow Fight Day. And what a load of fun it was! At just after 3PM, groups of people from all age groups and ethnicities arrived with pillows. And the fun began. We captured a few pictures of the mayhem that will be uploaded to the ektagon timeline on FB. The rest is better described in photos and since we were too busy having our bodies smashed with soft pillows we will give you links to media captured by other talented photographers who were at the event. if you were there and have some photos that are publicly view-able, drop us a link in the comments below. Thanks for everyone who organised, arrived and took part!